Designed by Sari Gilbert & Robert Batchelor. Published by Thinking Past. Kickstarting now. Pre-production prototype provided by publisher. 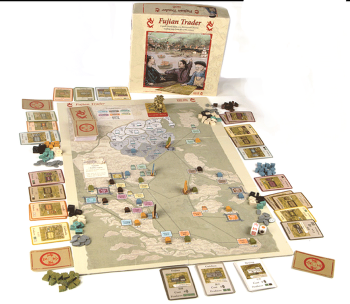 Fujian Trader is a trading game, but it's not the kind of trading game I'm used to. It's a game of real history, based on a 17th century map from an actual Chinese trading family from just before the Manchu invasion of China. 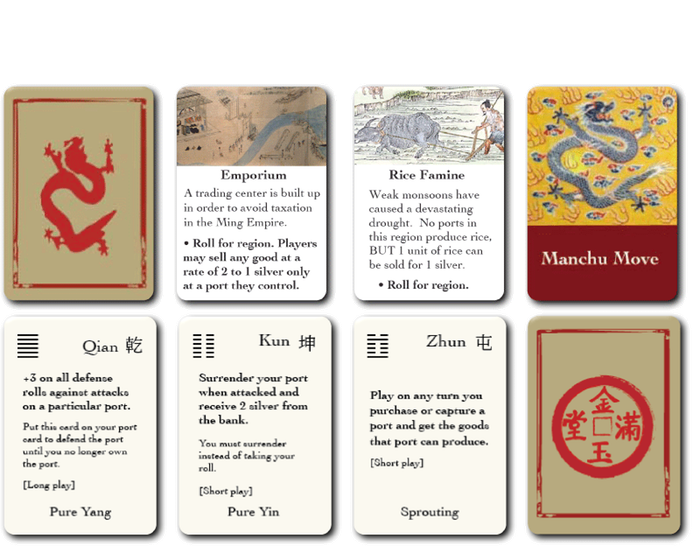 In the game, players take on the roles of powerful merchant families determined to wrest every ounce of influence and profit they can before the Manchu sweep into China and destroy their base of power. 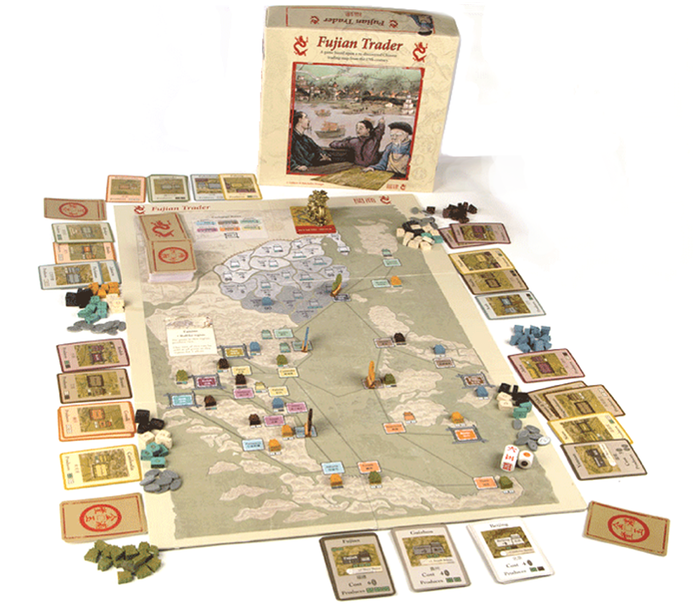 Opposed by rival clans and natural disasters, the players dance a game of cat-and-mouse, attempting to take over ports and trade routes. It's a great game with lots of indirect conflict between players - what others are doing affects you directly, but unlike a more direct wargame doesn't derail what you'd like to do. Fujian is a remarkably good example of a pure trading game, and will find a happy place in many collections as an archetypal example of this classic board game genre. It's Kickstarting right now if you'd like to take a look. Working from the trade routes on the board, players will move their ships from port to port, taking control of them and trading resources based on the region they're in. As they build up resources, players will trade those resources for money in order to secure provinces back in China. They'll use that power to become better traders, allowing them to more quickly gather resources and control in order to secure their trading dynasty's power when the Manchu invasion comes. In the game, you'll work out the ideal routes and areas of control, making sure that your turns both position you to sell goods for money, as well as put you in a good position to act the next turn. Each turn a colored die is rolled that corresponds to a region on the map. Every player who owns a port in that region will then collect a number of resources based on that port - something like two rice, a rice and an iron, or an iron and a silk. Those resources are then traded based on the region you're in for money. For example, rice is more valuable further away from the Chinese mainland, and iron is only valuable in military centers. You can also spend resources buying fortune cards, which allow you to temporarily break rules or make extra money for trades. You can buy control of ports around the map, too, placing a building of your family's color in it and securing control. Players traveling between two ports you control have to pay you a tax of one resource, and control of trade routes is worth more points at game end. Control of ports, though, isn't permanent. You can incite a rebellion against another trader by spending resources in an escalating bidding war for a bonus to an opposed die roll. It's a lot of fun to wrest control of a trade route the turn before you need to use it, and the final rounds of the game become a tense attempt to get as much power outside of failing China as you can. If you're curious more about how the game works, there's an in-depth how to play video series and general game overview available. For example, in one game, a player had a monopoly on the powerful trading routes heading south into indochina from the mainland. Throughout the game, other players bowed their heads and paid tolls that made this player ever more powerful, but come the end of the game that player's overconfidence had made them lazy, and the others had build up huge amounts of resources which they used in a final rush to steal key ports and ruin that player's network. Left without firm control over any of the regions they used to dominate, the powerful family was left in ruins and took a meagre third place in the game. Not every game of Fujian Trader is like that, however. The game's random resource production can lend itself to shutouts for some players. Diversifying is extremely important, and an unlucky players having trouble securing ports in every region can find themselves at wit's end with little or no resources. It's a problem inherent to any game with randomized resource distribution, and therefore introducing new players to this genre with Fujian will always be a risk. That said, Fujian Trader is in many other ways an incredibly solid game. There's a lot to love about its mechanisms, which feel both on-theme and abstracted enough that they're clearly well balanced. It's a game that will do well in the collections of nearly any strategy game fan, and building your trade empire is satisfying well into the third and fourth games of play. If you're curious to learn more about the game or get a copy for yourself, it's currently seeking funding on Kickstarter. Bottom Line: An archetypal example of how to do a trading game well, Fujian Trader is quick playing, easy to understand, and fun to master. Recommendation: Fujian Trader will find a spot in my permanent collection, and if you're a trading fan it should find its way into yours.